Originally designed for the DePaul University Law Library Project, the DePaul Collection emphasizes the inherent qualities of the wood grain, the elegance of designs simplicity, and the importance of craftsmanship. Solid wood trestle base with a stepped detail on the legs. Inset wood veneer top with a solid wood edge having a cove along the bottom edge. 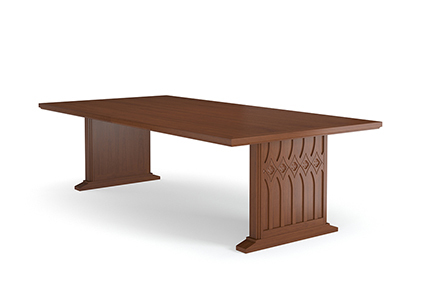 The DePaul Collection includes chairs, benches, study tables, carrels, and end panels. Who said library study tables had to be boring?